Fourier-transform infrared (FTIR) spectrometers, among the most frequently used research tools to identify and analyze chemicals, are too large to be used in the field to detect compounds. Several attempts have been made to develop miniaturized FTIR spectrometers for integration into drones to monitor greenhouse gases remotely, or for integration into smartphones and other devices. However, current miniaturized devices are costly to produce. 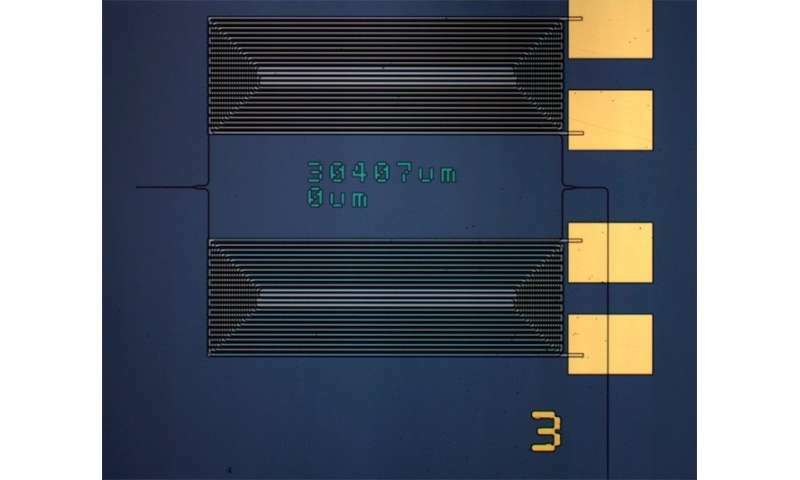 Scientists at the University of Campinas's Device Research Laboratory (LPD-UNICAMP) in Brazil, collaborating with colleagues at the University of California San Diego in the United States, have overcome these constraints by developing an FTIR spectrometer based on silicon photonics, the technology currently used to produce chips for computers, smartphones and other electronic devices. The study was led by Mário César Mendes Machado de Souza and a research internship abroad, and published in Nature Communications. Souza is the article's lead author. "Silicon photonics offers a platform for the fabrication of affordable high-performance miniaturized spectrometers," he said. According to Souza, FTIR spectroscopy identifies chemicals using an infrared light source to measure absorption. A sample is exposed to different wavelengths of infrared light, and the spectrometer measures which wavelengths are absorbed. The computer takes these raw absorption data and conducts a mathematical process known as the Fourier transform to generate an absorbance pattern or spectrum, which is compared to a library of spectra for chemical compounds to find a match. Projects have attempted in recent years to develop an FTIR spectrometer based on integrated photonics, which uses light especially in the infrared spectrum, but progress has been minimal owing to several technical challenges, Souza explained. One of these challenges is the highly dispersive profile of silicon waveguides, meaning that each wavelength travels at a different speed in this material and hence has a different refractive index. The refractive indices of optical waveguides in silicon can be "tuned" by means of the thermo-optical effect, which involves passing a current over the waveguide in order to heat it. Because the device has to be operated at high temperatures in order to achieve high resolution, this technique becomes nonlinear in the sense that changes in temperature correlate with disproportionate changes in the refractive index. "In practice, what happens when a thermo-optical effect is applied to a silicon-based infrared spectrometer with integrated photonics is that the Fourier transform mathematical operations used to convert the radiation spectrum data collected produce completely wrong results," Souza explained. The researchers overcame these challenges by creating a laser calibration method to quantify and correct the distortions caused by silicon waveguide dispersion and non-linearity. As a proof of concept, they developed a 1 mm² FTIR spectrometer chip based on standard silicon photonics fabrication procedures. The chip was tested in the laboratory, producing a broadband spectrum with a resolution of 0.38 terahertz (THz), which is comparable with the resolution of commercially available portable spectrometers that operate in the same wavelength range, according to the researchers. "The device we developed is far from optimized but still achieves resolutions comparable with those of the portable free-space optics-based spectrometers available in the market today," Souza said. The researchers now plan to engineer a device that is totally functional and integrated with photodetectors, light sources and optical fibers. "Our goal is to integrate the light source and the spectrometer's detector into the same platform," Souza said. Photonic waveguides suppress "crosstalk among neighbors"